WattHead.org Founder and Chief Editor and Breakthrough Institute Director of Climate and Energy Policy Jesse Jenkins was on NPR's Weekend Edition this past Sunday discussing Japan's nuclear crisis and what it means for the future of nuclear power. The interview touched on many of the issues that were the subject of a recent Atlantic Monthly article co-authored by Jenkins and Breakthrough Institute co-founders Ted Nordhaus and Michael Shellenberger. [L]ost in the hyperbolic claims of nuclear opponents, the defensive reactions of the nuclear industry, and the carefully calibrated repositioning of politicians and policymakers is the reality that Fukushima is unlikely to much change the basic political economy of nuclear power. Wealthy, developed economies, with relatively flat energy growth and mature energy infrastructure haven't built a lot of nuclear in decades and were unlikely to build much more anytime soon, even before the Fukushima accident. The nuclear renaissance, such as it is, has been occurring in the developing world, where fast growing, modernizing economies need as much new energy generation as possible and where China and India alone have constructed dozens of new plants, with many more on the drawing board. Absent Fukushima, developed world economies were not going to build much new nuclear power anytime soon. The deliberations in Germany have involved whether to retire old plants or extend their lifetimes, not whether to build new plants. The decade long effort to restart the U.S. nuclear industry may result in the construction of, at most, two new plants over the next decade. By contrast, even a much more serious accident would have been unlikely to delay the construction of new nuclear plants in the developing world for long. For major emerging economies like China and India, energy is still too scarce and expensive for much of their populations and economies and they will likely continue to build new nuclear plants as fast as they can in the coming decades. In the end, what it all looks like is business as usual, for nukes specifically and the global energy economy more generally. Despite the claims of proponents, present day renewables remain too expensive and undependable for any economy in the world to rely upon at significant scale. So Germany, despite its vaunted solar feed in tariffs, will rely more heavily upon coal, which it has in abundance, as it retires its aging nuclear fleet. The US, already in the midst of a natural gas boom, will use more gas. And China and India, desperate for every kilowatt of power they can produce, will develop every available energy resource they have as fast as they can, including nuclear. This click-able map shows the 104 active nuclear reactors in the Lower-48 states, overlaid with both recent earthquakes and the 15 strongest earthquakes in the region's history. Note that the most powerful earthquake on record, estimated to have measured 9.0 on the Richter scale, shook the Pacific Northwest back in 1700. You can click on each power plant to obtain more information about it, including the type of reactor design. The second (static) map shows the earthquake risk as measured by "Peak Ground Acceleration" or PGA. During an earthquake, the ground shakes back and forth, and the damage is roughly proportional to the ground's maximum acceleration. The map shows the two percent likelihood that the PGA will exceed the shown values in the next 50 years. Explore the maps, and read on for additional details below. The nuclear crisis following the disastrous 9.0 magnitude earthquake and tsunami in northern Japan continues, and it's raising broader questions about nuclear safety both in and outside of Japan. Many Americans now are asking how vulnerable our country's nuclear facilities are to natural disasters, particularly earthquakes. Of the reactors in the U.S., about one third of them are boiling water reactors, using the same technology as the Fukushima Daiichi reactor in Japan. In addition, there are eight nuclear facilities located along the seismically active West coast. Twelve of the American reactors that are of the same vintage as the Fukushima Daiichi plant are on seismically active areas around the country. Unsurprisingly, most of the earthquakes in the contiguous U.S. have occurred in California. But three of the most powerful 15 quakes occurred in Missouri, and another took place in South Carolina. And the strongest ever recorded, estimated to have measured magnitude 9.0, shook the Pacific Northwest back in 1700. The bottom map above shows the earthquake risk as measured by "Peak Ground Acceleration", or PGA. During an earthquake, the ground shakes back and forth, and the damage is roughly proportional to the ground's maximum acceleration. The map shows the two percent likelihood that the PGA will exceed the shown values in the next 50 years. In other words, if the map shows that the PGA is 1.0g for a given spot (say, southeast Missouri), that means there is a two percent chance that the peak ground acceleration will be greater than 1.0g at some point in the next 50 years. PGA is measured in "g," with one g being how quickly an object accelerates in free fall (you can also think about "pulling Gs," as in a fighter plane). The PGA risk is what is typically used to set building codes. Most nuclear power plants are designed to operate under 0.2g PGA, and automatically shut off if the PGA exceeds 0.2g. However, they can withstand a PGA many times larger than that. The magnitude scale is a measure of the total energy an earthquake releases. This is related to, but not directly proportional to the PGA. For instance, the recent earthquake in Christchurch, New Zealand, recorded a deadly PGA of 2.2g, even though it was "only" a 6.3 magnitude earthquake, while a recent earthquake in Chile, which measured 8.8 magnitude, recorded an acceleration of 0.78g. If you click on the nuclear power plants on the map at the top, you can see what the 50-year two-percent likelihood PGA is for each power plant. As the unfolding situation in Japan has demonstrated, ground acceleration is only one concern. In fact, the Fukushima reactor -- which is protected by a thick casing of concrete designed to withstand even a plane crash -- was built to survive an earthquake like the one Japan just experienced, and the peak ground acceleration at the plant on March 11 measured only 0.18g, according to one report. The safety of nuclear reactor design is addressed by "defense in depth," which means multiple back-up systems are installed as precautionary measures. If one safety measure fails, there are several others in place to prevent a nuclear emergency. The Fukushima complex was evidently not sufficiently prepared for the combination of an earthquake and a massive tsunami, and when the waves crashed around the power plant, the cooling system failed, leading to a cascade of problems. Some claim that the reactor design is partially to blame, as well. Whether the events at Fukushima will reveal systemic problems at other plants remains to be seen, but it certainly highlights the need to be somewhat imaginative when planning for the worst-case scenario. The bottom line is that a major earthquake would probably not result in a nuclear meltdown at the reactors on the above map, but it could present significant engineering challenges. Quantifying the risks, and minimizing them as much as possible, is a key task for everyone involved in the nuclear energy industry. Alyson Kenward contributed reporting to this article. For the second time in eight months, a coalition led by California Rep. Devin Nunes has proposed their Roadmap for America’s Energy Future (H.R. 909). The plan, introduced in the House last week, is advertised as a set of “comprehensive and forward thinking initiatives designed to address both the short and long-term energy needs of the United States.” Nunes and company deserve some credit for trying to straddle the market-and-drilling approach on the right with the green-deployment-now approach on the left; but, calling it a comprehensive energy policy solution? Far from it: the plan would do little more than drive fossil fuel development with some marginal progress on nuclear and renewables, while generally ignoring the need to drive innovation in the energy sector. First, the key components: the bill would open up the Arctic National Wildlife Refuge and the outer continental shelf (OCS) to drilling for oil & gas, codifying the aggressive five-year leasing program (PDF) proposed, quite literally, during the Bush Administration’s waning hours. It would also restore Bush Administration plans to open roughly 2 million acres of western lands in Colorado, Utah, and Wyoming to oil shale development, which were suspended by the Obama Administration, much like the OCS drilling program. The bill would then deposit the federal revenues gained from leasing royalties — generally 12.5 percent or 16.7 percent of the value of the lease, depending on location and water depth — in a new “American-Made Energy Trust Fund” establish within the Treasury Department. These funds would, in turn, be used to carry out a series of reverse auctions for renewable energy: contracts would be awarded to those generators who could produce megawatts at the lowest cost, multiple times a year and in different regions. On nuclear, the bill takes several steps. The Nuclear Regulatory Commission (NRC) would be required to issue 200 new permits by 2040, and to finish consideration of Yucca Mountain or find an alternative site within a year. The bill attempts to streamline the licensing process, establishes a national nuclear council, and opens the door to increased funding for small modular reactors (SMRs) and spent fuel recycling, among other things. Lastly, the bill would direct the Defense Department to move forward on coal-to-liquid fuel technology. The real goal of any “comprehensive” energy policy must be to efficiently drive the clean energy transformation, simply put. This is best achieved through aggressive investment and support for energy innovation from lab to market, with the end goal of delivering affordable technology. The Roadmap’s sponsors take a worthwhile stab at this goal through the renewable energy reverse-auction idea. It’s an appealing premise: whereas production tax credits from clean power offer a flat subsidy per unit of energy produced, a reverse auction — with DOE as the demanding buyer and renewable generators as the striving sellers — can award contracts to those power producers who are able to achieve the best performance, each year. That means a built-in competition mechanism, forcing companies to compete against one another. And it sets limits on awards per source and per size, which means contracts wouldn’t be the exclusive domain of any one (or two) cheap technologies or biased in favor of large producers, ensuring an open field. As an incentive to help drive continual technical improvements in existing technology, it seems solid. Beyond the auction, the plan also takes some decent first steps on innovation in the nuclear space, specifically on SMRs. The NRC does need to increase its manpower and resources devoted to assessing SMRs, a promising next step in nuclear technology, and while the bill guarantees nothing in terms of funding, it nevertheless acknowledges the problem. And some future reactor designs will run on spent fuel, so requiring NRC to pursue rulemaking on spent fuel recycling in the next two years is a good step forward. But beyond these measures, there’s not much else to recommend it. There’s zero investment in the building blocks of innovation: no R&D support or tax credits, no public-private partnerships to develop energy gamechangers, no mention of manufacturing. This is a real shame, given that Nunes and company have devised what could be a sizeable fixed revenue stream for investment via drilling royalties. Revenues should theoretically reach tens of billions per year — well within the range of investment most experts say we need. The reverse auction is a nice idea for back-end competitive market creation to drive down costs of existing technology, but without investing in front-end development to achieve big breakthroughs in new technology — especially technologies too risky for a risk-averse private sector — you’re not really solving the problem and filling the critical innovation gaps. Radical new technologies will naturally be more expensive than existing, deployed technology at first, so you have to be careful about crowding them out. About that revenue stream: the truth is, while a carbon tax would undoubtedly be a better source of revenue, clean energy advocates might want to at least give drilling royalties a look, counterintuitive as it may be. Expanded drilling is probably more likely to pass Congress than a decent carbon tax at this point. With the recent run-up in gas prices, the typically short-sighted chorus for expanded production has already started. In fact, using expanded drilling royalties to fund a clean energy revolution might be the single best argument for opening up federal lands and waters...not that there are many other good ones. If the goal of national energy policy were to promote prolonged fossil fuel use without having a meaningful impact on petroleum prices, the bill could succeed wildly. The Minerals Management Service (now the Bureau of Ocean Energy Management, Regulation and Enforcement) has estimated the existence of roughly 85 billion barrels of recoverable oil and 420 trillion cubic feet of natural gas on the OCS, and the USGS says there are 10 billion barrels in ANWR. The real mother lode, however, is western oil shale: the U.S. easily holds the largest reserves in the world, and could yield 800 billion recoverable barrels or more, assuming any commercialization challenges could be met. Given that the country consumes around 19 million barrels per day, these appear to be large sums…except when one considers production ceilings. RAND has said it could take decades to achieve even three million barrels per day from the oil shale deposits; the president of Chevron has said we might see 1 million barrels per day from the OCS; and EIA has estimated similar sums from ANWR, eventually. So we realistically might see, what, a 5 million barrel-per-day boost in 10-20 years? The idea that global oil prices will somehow be restrained by expanded domestic drilling anytime soon is sublimely stupid. And this doesn’t even get into the emissions question. Originally posted at ITIF's Innovation Policy Blog. There is a growing chorus of experts, businesses, and public sector leaders espousing for one key clean technology: small modular nuclear reactors (SMRs). And the reason is clear. These next generation advances in nuclear energy may be – dare I say – a silver bullet energy solution that transforms electricity generation, provides the military with an independent and more secure energy source, and offers industries a low-carbon energy alternative. And like other clean technologies, and maybe even more so, SMRs require significant federal support to make them a viable clean energy option. The significant up-front capital cost and decade-long development time for licensing and constructing large power plants has renewed interest in smaller nuclear options in recent years. In response, nearly 60 SMR designs have been proposed worldwide, though none have been deployed. Their main selling points: reduced cost, customizability, safety, less nuclear waste, and long power generation lifetimes without refueling (table below). Currently, two broad design categories have emerged. Light water reactor (LWR) SMRs are similar to scaled down versions of current large nuclear power plants. LWR-SMRs range between 200-300 megawatts and are aimed at providing new baseload capacity or act as a replacement for retiring coal power plants with a 4 to 5 year fuel replacement cycle. LWR-SMRs are also closest to deployment. The first demonstration project – the mPower LWR by Babcock and Wilcox - is set to take place at the Clinch River Site by the Tennessee Valley Authority. The second category is advanced SMRs, otherwise called fast-reactors or high temperature gas-cooled reactors. These designs are at an earlier stage of development because of their use of untested coolant system designs and more highly enriched fissionable material than presently regulated plants. But these reactors offer the prospect of much longer refueling lifetimes, often in excess of 10 years, and more flexible site locations, because many don’t use water for cooling. So, while “silver bullet” may be too strong of a statement – SMRs don’t solve all our clean energy needs - the potential benefits of SMRs are significant and the key to realizing these benefits comes down to creating a cohesive national clean energy policy to innovate through a number of technological barriers. And I’m not the only one who thinks so. This week was the 23rd Annual Nuclear Regulatory Commission Information Conference that brought together hundreds of nuclear energy leaders from industry and government to talk all things nuclear. The hottest topic? SMRs. The clear message? Industry and government leaders are ready to move forward in developing new small reactors as soon as policy makers give the green light. In his opening conference speech, NRC Chairman Gregory Jaczko remarked that his agency will be taking the first steps in licensing new SMRs by announcing that, “[the NRC] may take final action on three design certification rules for new [LWR-SMR] reactors as early as this summer, and conduct the first mandatory hearing on a new reactor license since the 1970s.” Department of Energy’s Director for Advanced Reactor Design Sal Golub presented that the goal of his office is to “license and deploy LWR-SMRs by 2020.” The President proposed in both his 2011 and 2012 budgets to create a nearly $100 million SMR program within the DOE Office of Nuclear Energy that would focus on deploying LWR-SMRs as well as perform much needed advanced SMR RD&D. And bipartisan group of Senators have recently proposed a bill designed to speed up the deployment of SMRs. But there is an immediate policy barrier: the federal clean energy innovation budget. While Congress debates how best to reduce the federal budget deficit, clean energy innovation is in the unfortunate position of being a prime target. Like other emerging clean technologies, reducing or eliminating support for SMRs could effectively set back the United States nuclear industry by decades. NRC Chairman Jaczko stated firmly that possible budget issues require, “…tough choices…because if everything is a high priority then nothing is.” Essentially, if the NRC budget is slashed, its staff would have to focus on the 44 large reactor applications it is currently reviewing and not be able to more quickly attend to licensing first-of-kind SMR designs. The same budget decisions would have to be made by DOE if their proposed SMR program is not funded. And the stakes are high for policy makers to “get it right” on clean energy innovation policy. Presently, Russia is preparing to deploy the world’s first electricity generating SMRs and France has quickly progressed in developing their own SMR designs. In fact, the majority of SMR designs aren’t being developed in the United States and many U.S. nuclear technology companies are looking to foreign countries to deploy their technology. Whether this possible clean energy game changer has an impact environmentally and economically in the United States is up to policy makers because everyone else is waiting. In the latest in DC's battle over the federal budget, the Senate Democrats released on Friday their plan to fund the government through FY2011, which would make substantial cuts in federal energy innovation across DOE agencies. 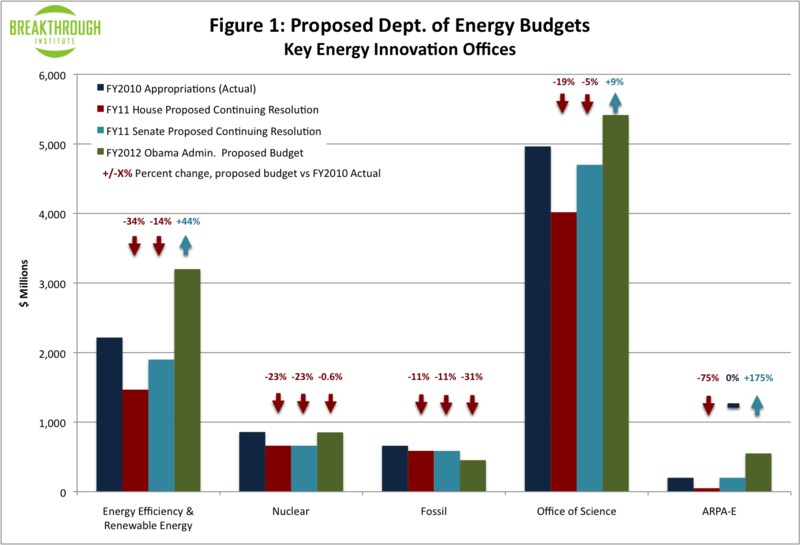 While ultimately keeping energy innovation-related spending at a higher level than would the House's Continuing Resolution (CR) (passed two weeks ago), the Senate's plan decreases budgets for each of the DOE's offices involved in energy-innovation as compared to FY2010 appropriations, in sharp contrast to the proposed increases for energy innovation related spending through President Obama's proposed FY2012 budget. *ARPA-E received $400 million in ARRA funding, to be spent over FY2009 and FY2010, or $200 million per year on average. No additional funding was provided for the agency in regular FY2010 appropriations. **The estimates for Fossil Energy R&D used in this post refer solely to the Fossil Energy R&D program, rather than Fossil Energy Program as a whole, as Fossil Energy R&D is where energy innovation investments are concentrated. ***For exact figures, see chart at the end of this post. Overall, the plan would cut over $800 million from the overall budgets of key DOE agencies engaged in energy innovation, relative to FY2010 levels (see Graphic 1/Table 1). Below, we estimate the impact on direct energy innovation investments that would result from these cuts. (Graphic 2/Table 2). We find that the overall budget cuts would strip at least $332 million in energy-innovation specific investments from these DOE agencies relative to FY2010 levels. 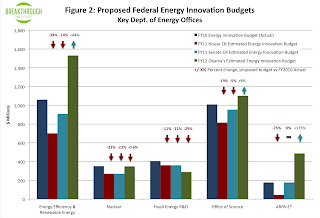 *Calculations for share of FY11 House and Senate CR budgets devoted to energy innovation for the Fossil Energy R&D program are estimates based off of proportion of 2010 Fossil Energy R&D budget devoted to energy innovation projects. However, calculations for share of the FY12 Obama Administration's proposed budget for Fossil Energy R&D differed, as the Administration stated throughout the proposed budget its goal of phasing out inefficient fossil fuel subsidies, and proportions of total budget devoted to energy innovation are expected to change accordingly. For an explanation of the calculation used to estimate that number, see this post. **See here for details on methodology used to estimate energy-innovation proportions of office budgets. The largest of these cuts would come from the Office of Energy Efficiency and Renewable Energy, which is engaged in the research, development, demonstration and deployment of renewable energy and energy efficiency technologies, and whose energy innovation budget would be decreased by approximately $152 million. The Office of Science (OS), too, would see an energy innovation budgetary decrease of $55 million from FY2010, and the Office of Nuclear Energy's energy innovation investments would decrease by $81 million. This plan is merely a starting point as the House and Senate gear up for negotiations with the White House over how to fund the government for the rest of the fiscal year. However, this presents a worrisome development for energy innovation investments, as the opening positions of both chambers of Congress now embrace across-the-board cuts in energy innovation investments. Senate Democrats appear poised to abandon the Obama Administration's efforts to preserve or enhance critical national investments in energy innovation, and as the House and Senate close the gap between their two proposals, more cuts may be forthcoming. Welcome to Climate Central's weekly science round up. Among last week’s noteworthy research papers were an investigation of over-estimating improved energy efficiency, a look at how the allergy season is growing longer, and a study of the history—and future—of drought in the American southwest. Also published last week were a pair of studies on heavy rain (over North America and Hawaii) and a review of California's changing temperature trends. The Gist: This paper investigates the “rebound effect" — the idea that if consumers replace old products with more energy efficient ones, they won’t save as much energy as expected because they will actually use some of their extra savings to buy more energy. For instance, the rebound effect says if lighting is more efficient (and thus cheaper) consumers might end up using more lighting in their homes. People would probably still use less electricity than they did originally, but they wouldn’t have “saved” as much energy as anticipated by simple calculations. This new study concludes that in Germany (where the research was done), consumers who purchase more efficient cars drive more miles, but only up to a point. In this case, the rebound effect is strongest for users switching from low-efficiency cars to medium-efficiency cars, but it disappears with cars that get about 30 miles to the gallon. More generally, the “rebound effect” has recently been discussed by The New Yorker, The Breakthrough Institute, and Rocky Mountain Institute. The Gist: Some plant and animal species — especially those with short life spans and large populations — will adapt to climate change through natural selection and evolution. In fact, some species, such as mosquitoes, which have short life spans and can thus adapt quickly, have already “evolved” due to climate change. Scientists have shown that warmer temperatures have caused the genetics of some mosquito populations to change. This particular study suggests improved ways to model how different species will adapt to global warming, taking into account their ability to evolve relatively quickly. The Gist: By studying sediments in New Mexico, these researchers estimated precipitation and temperature in the region for the period between about 370,000 and 550,000 years ago. Why is does this past climate matter? The researchers found that during the warmest times of that period — which might have been slightly warmer than today — the region experienced extreme drought. Most climate models predict that the U.S. southwest will experience severe drought as the planet warms. This new study shows this type of “permanent dust bowl” could develop in the future because it happened in the past. The New York Times offered a nice summary of this research earlier in the week. And in the journal PNAS this week, another study examined how a drier Southwest could increase wind erosion as the vegetation changes in response to drought. The Gist: Analyzing 80 years worth of climate data in California, this study finds some interesting results: the average daily low temperature warmed more than twice as much as the average daily high (a warming of 1.36°C versus 0.56°C over 80 years). The researchers did not study why these trends have evolved differently over time but they say the discrepancy is a sign that there are probably many different factors influencing how temperatures are changing in the region. The Gist: Last week we reported on a series of papers that provide evidence climate change has probably already increased the amount of rain falling in big storms. This week, a new paper looks at heavy rainstorms specifically in North America, finding that for locations along the Atlantic and Gulf coasts, hurricanes account for a disproportionate number of the storms with heavy rainfall. How hurricanes respond to climate change — which is still uncertain — will determine the future of heavy rainstorms in these areas and this topic is now being heavily researched. The Gist: Climate change is expected to increase heavy rainfall, on average, across the globe. But will every place experience stronger storms? Because there are so many factors that influence regional rainfall, including temperature, humidity and larger climate oscillations like El Niño, more localized studies can offer more insight to this question. This study examines projections for rainfall in Hawaii and finds that climate models don’t show a major change in number of days with heavy rain. This estimate, though, is highly uncertain because currently climate models don’t agree on how rainfall will change in that region. The Gist: Global warming is lengthening the ragweed pollen season, and this trend is especially evident in northern areas. Within the northern U.S. (northward of Oregon, South Dakota and Vermont, for example) the pollen season has increased between 13 and 27 days since 1995. Last week, Climate Central provided a more in depth summary of this article. The Gist: This paper surveys recent studies of how climate change could affect agriculture in Africa and finds there is wide disagreement. Some research says crop yields will generally increase across the African continent but others say yields will decrease. The range is broad because not only are modelers trying to predict how greenhouse gases will warm the planet and how plants will respond, but they are also trying to predict how farmers and markets will respond. Combining these natural environmental factors with socioeconomic influences is still particularly difficult task. Nonetheless, this new review paper concludes that Africa’s agriculture faces significant risk from warming temperatures. The Gist: Last year China set a goal of powering 27 million homes with biogas — gas from fermented human and animal waste (yes, that can include animal feces). The biogas is produced by putting waste in airtight containers where anaerobic microbes turn it into methane gas. The methane can then be burned for heat, allowing people to heat their homes without using fossil fuels. Methane, however, is also a potent greenhouse gas; if large quantities of the gas escape into the atmosphere before being burned, it could potentially cause more warming than the carbon dioxide produced by burning fossil fuels. This study analyzed methane leaks at the gas production sites and people’s houses and determined that even somewhat leaky systems emitted much less gas to the atmosphere than houses that used coal or natural gas. That’s all for this week. If you have a question about one of these papers, feel free to ask in the comments below. There are times when the nation’s political leadership in Washington is perfectly in sync with the realities of the day, and there are times when much of that leadership is out to lunch. Exhibit A: the current energy debate. Even as global demand and instability threatens to challenge affordable supply, and as overseas states are investing heavily in clean technology, many of the nation’s leaders are contemplating gutting domestic investment in clean energy. Amid this context, enter the 2011 ARPA-E Energy Innovation Summit, a gathering of some of the best and brightest in clean energy innovation intended to showcase often-astounding advances in energy technology. The Advanced Research Projects Agency-Energy – one of the single most important agencies in the federal innovation portfolio – has recently been fighting for its budgetary life, surviving a recent push to de-fund the program, and still facing significant uncertainty over future appropriations. Yet few programs are doing what ARPA-E is doing: supporting cutting-edge energy research in the private and academic sectors in search of revolutionary game-changers to fundamentally alter our energy landscape. Even given its relative youth and small size, the agency has attracted plaudits for its ability, as when CO Sen. Mark Udall remarked of ARPA-E at the summit, “You're a model of efficiency. That’s government at its best.” On top of this well-earned reputation, multiple expert recommendations have said ARPA-E is critical to American cleantech competitiveness and urged a boost to its original $400 million budget. And last year Congress saw fit to reauthorize the agency for three more years in the America COMPETES Act, albeit at lower levels than has been recommended. Suffice to say, we hope those leaders out to lunch will finish up soon and get back to investing in the future. And that vitality is there for good reason: the energy technology sector—from private entrepreneurs and investors to scientists and engineers in university labs—is brimming with, well, energy, in the form of radical and frequently eye popping ideas for advanced low-carbon energy technology. Dozens of these experimental projects – many of which are supported by ARPA-E – were on display at the technology showcase, a sampling of which can be found here (with photos here). In the midst of a burgeoning trillion-dollar market, many of these technologies could yield massive returns on investment – assuming, of course, adequate and appropriate policy support is there to accelerate their development. The discussion covered much more ground than can be summarized here, but there were a few key themes that rose to the surface through the summit. Top Navy official John Quinn told the summit his superiors need to “be bold” on energy innovation. Partnering with ARPA-E is a good start: Navy Secretary Ray Mabus made news by announcing a pair of energy storage projects in partnership with ARPA-E. Many have made the connection between overseas fossil fuels and national security risks, but Mabus also made clear during his speech that clean energy also represents an opportunity: to make a more agile and efficient fighting force free of dangerous supply convoys, as well as to reduce the need to defend the global oil pipeline. Solar-powered rucksacks save marine patrols from having to carry 700 pounds of extra weight. And alternative fueled ships like the USS Makin Island could save hundreds of millions of dollars in costs. Contrast this with Mabus’ observation that every $1 increase in the price of oil costs the Navy $31 million (and keep in mind, world crude has increased by $30 over the past year). These are resources to purchase, transport, and protect that could be used elsewhere. Whether through the use of supercomputers to develop more efficient wind turbine blades or the development of innovative software to develop new and better chemical energy solutions, IT was a common theme throughout the summit and stamped on nearly every project. For example, CREE Inc. – an ARPA-E supported business – is developing the necessary technology to seamlessly integrate grid-capacity clean energy and rapidly charge electric cars on-grid. Their idea seeks to create an efficient, intelligent substation, replacing traditional transformers, to manage the stream of energy coming from clean sources to consumers. These new transformers would be drastically smaller and much less costly, and act as an IT middle man – allowing bidirectional flow of energy (consumers both producing and consuming clean energy) as well as efficiently managing the often time-inconsistent flow from clean generators through a smarter grid (which would of course be mitigated by advanced storage eventually). Another showcased example is Arkansas Power Electronics International (APEI). Consumers will require plug-in vehicles to rapidly charge, just like gasoline power vehicles can be quickly refueled. But with greater penetration of PHEVs, rapid charging could quickly strain or overload the grid and local infrastructure. APEI showcased advances in small, modular power conversion technologies utilizing silicon-carbide semiconductors that promise high-temperature operation, meaning they would allow for high power densities conducted by rapid-charge PHEVs. And because this technology is modular and significantly smaller than typical high power density converters, their cost is greatly reduced. What also was clear is that government has an important role to play in boosting that sector, through a comprehensive approach: stable market creation for scaleup, targeted R&D support, incentives for investment, and a coherent strategy to tie it all together. Business Roundtable President and former Michigan Governor John Engler highlighted the importance of making the R&D credit permanent and in continuing to foster productive programs like NIST’s Manufacturing Extension Partnership. I've said it before and I'll say it again: when it comes to the global climate challenge, as goes China, so goes the world. Driving that aphorism home, co2scorecard.org, a not-for-profit project that closely tracks global greenhouse gas emissions, now reports that China's CO2 emissions increased by 906 million tons in 2009 -- the second largest annual increase for any country in recorded history. China's soaring emissions were enough to completely offset the drop in emissions wrought by the economic havoc plaguing much of the Western world (see graphic below). Over the last decade, China's annual emissions of climate destabilizing CO2 jumped by 5 billion tons per year. According to Shakeb Afsah, President and CEO of co2scorecard.org, that's "the highest [increase in annual CO2 output] for a single country in recorded history, representing an average annual emissions increase of almost 12%--more than four times the rate observed [for China] the previous decade." To put this unprecedented 5 billion ton increase in annual CO2 emissions in context, Mr Afsah and colleague Kendyl Salcito note that during the 14-year long post-war boom period of 1959-1973, during which U.S. CO2 emissions rose each year, America's annual output of CO2 jumped by only 2 billion tons. This new analysis comes on the heels of the latest International Energy Agency's World Energy Outlook, which projects China's soaring demand will single-handedly account for 36% of all global energy demand growth over the next 25 years. According to the global energy watchdog group, China's energy use will rise 75% between 2008 and 2035, raising the nation's share of global energy use to 22 percent, up from 17 percent today. That factoid means there's more going on here than just simple economic growth driving emissions growth. China's macroeconomic policies are actually driving the carbon intensity of the nation's economy backwards, working at cross-purposes with the central government's avowed climate strategy. The analysts at co2scorecard.org point the finger at China's promotion of an export-oriented manufacturing economy, including the nation's increasingly controversial currency policies. Since joining the World Trade Organization in 2001, China has built up a manufacturing juggernaut that has taken over global supply chains for some of the world's most energy intensive industrial processes, including cement, steel, glass and chemicals production, turning predominately to carbon-intensive coal to fuel this economic engine. That was a recipe for both soaring economic output and carbon emissions alike. Through the global recession, China's depressed exchange rate protected its energy intensive industries, serving as a subsidy for export-oriented manufacturing industries (Wolf 2009). Other countries that would have grown their industrial sectors couldn't compete against China's deflated prices. So China has ended up with a lion's share of industrial production within its economic pie, subjecting itself to a sub-optimally large share of CO2 emissions and other industrial pollution. China's carbon commitments: ambitious or lackadaisical? To meet a targeted 40-45% reduction in carbon intensity by 2020, announced in November 2009 as China's pledge at global climate negotiations in Copenhagen that year, China's central government has recently forced the closure of inefficient factories and power plants, enforced planned blackouts, and launched other seemingly heavy handed steps to reduce the energy intensity of the national economy. Despite these high-profile measures, analysts including Breakthrough Senior Fellow Roger Pielke Jr., have repeatedly warned that China's seemingly ambitious climate target really just amounts to continuing on a course of business-as-usual -- which would mean another decade of unprecedented emissions growth. Messieurs Afsah and Salcito note that this latest evidence adds credence to such concerns. "Though impressive on paper," China's carbon intensity pledge "represents the status quo," the duo writes. Between 2005 and 2008 China's average annual CO2 intensity reduction rate was 4.35%, according to co2scorecard.org's analysis. Simply continuing that BAU rate would see China's emissions shrink 45% in around 13 years - by 2018, or two years ahead of their pledged goal. "Maintaining the 4.35% reduction rate would not require any additional effort on China's part," Afsah and Salcito write. But hitting their goal in 2020 instead of 2018 would mean China could even slack off a bit, requiring just a 3.9% annual reduction. "China is not just setting itself up for a business-as-usual carbon intensity reduction plan; it has committed to a lazier plan, allowing its emissions to continue increasing for an extended period of time," write Afsah and Salcito (see graphic above). Worse yet, China's primary focus on improving industrial energy efficiency as the key to meeting carbon intensity goals is almost perfectly designed to trigger rebounds in energy demand that erode or even negate climate gains from such measures. As noted in Breakthrough Institute's February report, "Energy Emergence: Rebound and Backfire as Emergent Phenomena," energy efficiency measures lower the effective price of the services derived from fuel consumption -- heating, cooling, transportation, industrial processes, etc. -- thus triggering a rebound in demand for those services (see a FAQ on rebound effects here). These "rebound effects" are likely to be particularly pronounced in both industrial sectors and in developing nations, like China, where demand for goods and services, including energy services, is far more elastic (responsive to changes in price), and where industrial productivity improvements are key drivers of economic growth. For every step forward taken through efficiency, rebounds in energy demand take China -- and the world -- one or more steps backwards away from climate mitigation goals. Thus, increased efficiency, particularly in China's industrial sectors, will drive greater economic growth and energy use. The net effect: total CO2 emissions are likely to keep soaring, even as China meets its lackadaisical carbon intensity goals. Is there any way then to really break the link between China's soaring economic output and soaring emissions? Pursuing China's current path of unambitious carbon intensity goals -- principally met with industrial efficiency efforts likely to trigger serious rebounds in energy demand -- looks like a recipe for continued disaster. And while co2scorecard.org's Afsah and Salcito note that a halt to China's currency depreciation efforts and other economic policies designed to spur an exports and industrial manufacturing-fueled growth strategy would cool both emissions and economic growth rates, this analyst considers it unlikely that China will assent to policies that drive down carbon by simply slowing economic growth. That leaves only one other real option then: de-link economic growth from carbon emissions by fueling China -- and the world -- with clean, affordable, and massively scalable energy technologies. Unfortunately, the menu of technologies that meet all three of those criteria -- clean (e.g. zero or very low-carbon), cheap (e.g. relatively affordable compared to conventional fossil fuels), and massively scalable -- is still quite limited. Cleaner energy alternatives must continue to improve in price, performance, or both, to meet a 'China-sized' appetite for energy. On this point, a cadre of energy experts including analysts at the IEA, U.S. Energy Secretary Steven Chu, dozens of Nobel Laureates, high-profile American business leaders, and leading think tanks, are all united: we must make clean energy cheap, and fast. China is already on a roaring path towards single-handedly swamping any hopes of climate stability, and success is far from assured. The only thing that is certain is that the clock is ticking, and there's no time to waste in developing clean, cheap, scalable energy technologies to fuel both China and the world. The entire climate challenge hinges on our ability to do just that. As the writer and environmental activist Bill McKibben is fond of saying, "You can't negotiate with the planet." Bill's right of course. But as TIME magazine environmental correspondent Bryan Walsh observes, "it turns out you can't negotiate with the human desire for growth and development either--not in any political system on this planet. We need policies that provide us with the energy for both--or we may end up with neither."